I stopped in the pit lane after 2 laps to check tyre pressures and was alerted to water leaking from the back of the car. It looked like we had not screwed the water cap on correctly and the car boiled over. I tried to get back out on track, but the engine was overheating, so we retired to our paddock base. It took over an hour to cool the engine, refill and bleed the system and get back on track. Over the lunch break we finally fitted new tyres. (The original set lasted 6 race weekends, 2 test days and 2 track days which is good value for money). In the afternoon we got some good track time, but only ever put 3/4 of a good lap together, getting into the 2m 17s. For the last session we stiffened the rear anti-rollbar to maximum, and this helped with more predictable handling (light understeer) through the fast corners. I got myself clear track for most of the session and went over 1.5 seconds faster than in testing the day before. The car handled well and I hit most of the apex and exit curbs for a really good lap. 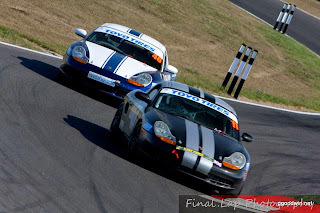 I qualified an excellent 9th (2m 16.1) out of 14 Class-A Boxsters and 31 cars in qualifying. In the afternoon the temperature soared to 30 degrees in the paddock. We made no changes to the car bar reducing tyre pressures. I missed 2nd gear off the start line and went backwards a couple of places, then I lost a couple more navigating cars which had spun at the first hairpin, so not a great start. On lap 3, I overtook a car which was slow out the fist corner, but couldn't stop on the dusty inside line into the hairpin. Unfortunately I clipped and spun another car ahead in the hairpin. Both cars recovered and I decided to just bring the car home (now without working ABS). However on the penultimate lap I spun when I misjudged my braking losing another two places. In park ferme my car was found to be leaking all the water out of the back again! This time with a definite split in the coolant tank due to the extreme heat. Luckily TF Motorsport had a spare at their workshop, so we hatched a plan to collected this at 7am Sunday and with the help of an extra pair of hands from another driver the car was ready by lunchtime. This was a major feat for us, as this is a very time consuming and difficult repair job. I got a reasonable start but there was no room to pass a car two rows ahead who didn't. I was faster in a number of corners, but never quite got close enough to pass. After 3 or 4 laps I was finding it harder to maintain corner apexes as my tyres started to overheat. With two laps left I was a sitting duck up the main straight and I was passed on the outside. Unfortunately the driver spun a lap later - just pushing too hard. I got another place back to another spinner and finished much happier in 10th. The Championship moves to the short Indy circuit at Brands Hatch in just 3 weeks time, so there is no opportunity to do any work to the car before then.